Very well made and not too large! I like the color in person, it's actually a little darker blue than pictured. The monogram is really well done, as well. We will use these for our hot tub towels. I'm pleased with the craftsmanship. I recommend! This ultra-soft and extremely absorbent Pestamel Fouta towel wrap is made from 100% natural cotton hand-woven on ancient looms in Turkey. 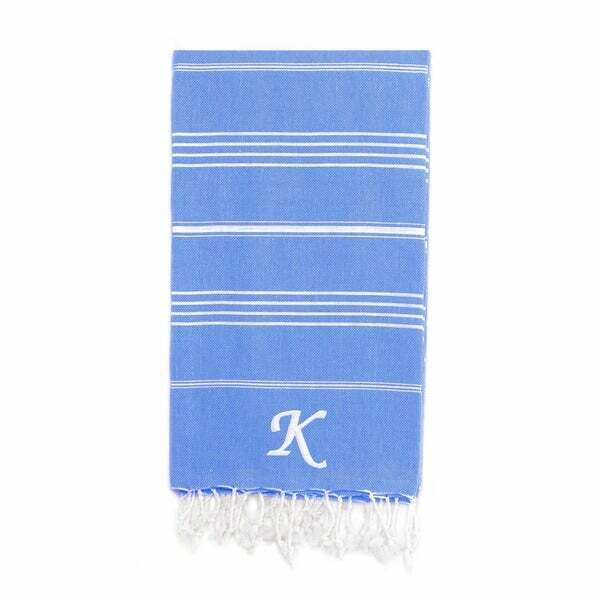 Choose a single initial monogram on this lightweight and generously sized herringbone weave Fouta towel. The pestemals are hand-loomed and shipped in batches per loom, which may cause slight variations in color depending upon the dye lot. Soft -nice color-no one else has it! !